The Texas Stars announced three player moves today. First, center Dustin Jeffrey was recalled to the Dallas Stars. Second, Pat Nagle and Russ Sinkewich were sent to their respective ECHL clubs, Idaho and Toledo. The Nagle return was expected with Nilstorp getting ready for Saturday's game. Russ Sinkewich's return was also expected after last night's return of Jykri Jokipakka to the lineup. The Jeffrey recall is a little puzzling from a performance standpoint. He was pretty uninvolved and uninterested in the games he played in the American League this week. The Dallas Stars are heading out on the road so it looks like it was a depth recall for the trip. 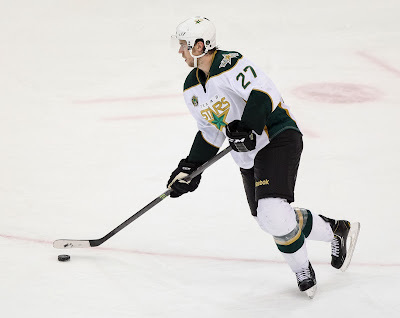 The Texas Stars, proud American Hockey League affiliate of the Dallas Stars, announced today that Dallas has recalled center Dustin Jeffrey from loan with Texas. The team also announced that goaltender Pat Nagle has been returned on loan to the Idaho Steelheads and defenseman Russ Sinkewich has been returned on loan to the Toledo Walleye, both of the ECHL. Jeffrey, 25, has played two games for Texas, posting seven shots and a plus-1 rating this season. He has skated in 22 games for the Dallas Stars and Pittsburgh Penguins this season, posting two assists and 18 shots for both clubs. The 6-foot-1, 205-pound forward has played 112 career NHL contests registering 29 points (15 goals, 14 assists). Originally drafted by Pittsburgh as the 171st selection in the 2007 NHL Draft, the Sarnia, Ont., native was claimed off waivers by Dallas on November 17, 2013. Nagle, 25, has been recalled to Texas twice this season and has served as the team’s backup goaltender for the last three games. The Bloomfield, Michigan native has appeared in 23 games for Idaho this season, posting an 11-11-1 record, with a 2.79 goals-against average, a 0.920 save percentage and one shutout. He signed a standard AHL contract with the Stars on August 27, 2013. Sinkewich, 28, has three points (1 goal, 2 assist), a +1 rating and two penalty minutes in seven games for Texas this year, including scoring his first career AHL goal on January 3rd at Charlotte. The Westlake, Ohio native also has 11 points (1 goal, 10 assists) and 25 PIMs in 21 ECHL games for the Toledo Walleye and has one assist in one AHL game for the Lake Erie Monsters. Sinkewich originally signed a professional tryout contract (PTO) with Texas on December 18th and was signed to a standard AHL contract by the Stars on January 15th. After the disappointment of dropping Saturday's game against the Griffins, Texas has a chance to get right back on the horse at home against the San Antonio Rampage this evening. If they win, they'll pass Grand Rapids for first place in the conference, at least for now, and setup what will surely continue to be a back and forth between the two clubs for the rest of the season. Grand Rapids plays again Friday, and Texas plays Saturday and Sunday. GRG and Texas don't play again this season, so it will be a battle by proxy. It starts tonight against the Rampage. The Stars will look to return two players off injury tonight. Brett Ritchie and Jyrki Jokipakka have been practicing this week full contact. Unfortunately, those two will be the only players heading back onto the ice tonight. Cristopher Nilstorp is close, but instead it will be Robinson and Nagle for Texas. The expectation is that Nilstorp could go this weekend against Toronto. He has been practicing this week and getting treatment from the training staff as well. With only one game in six days here this week, they have the luxury of caution. Jack Campbell is still nursing his knee injury, according to goalie coach Mike Valley. Valley said that the young Star is obviously eager to get back on the ice but the club wants to make sure the injury doesn't affect his long-term health and development. The Rampage have been gutting it out in extra time of late. The team has needed OT or a shootout in six of their last seven, winning three of those. The points have helped vault them ahead of the Barons and keep them ahead of the Comets in the standings. 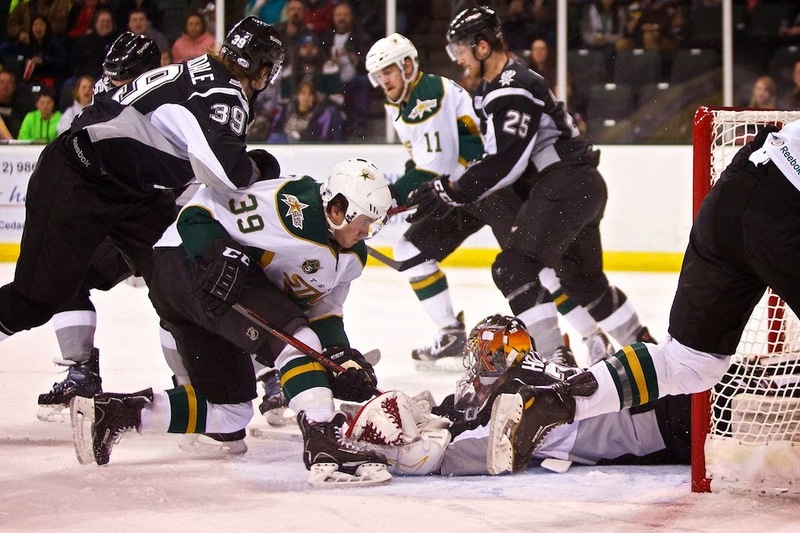 There is still a lot of ground to be made up for the Rampage if they hope to play hockey in May in the Alamo City. In a promising sign though, they defeated the Grand Rapids Griffins in a come-from-behind victory on Sunday. Albeit the third game of a three-in-three for GRG, it was a good win for San Antonio. After trailing 5-2 in the second, they scored all the remaining goals and won 6-5 in OT. John McFarland was the OT hero. Jacob Markstrom stopped 35 of 40. As Coach Desjardins told the assembled media earlier today, Texas has recalled goalie Pat Nagle from Idaho today to backup Josh Robinson tomorrow against San Antonio. Cristopher Nilstorp has been practicing this week and could be ready for the weekend. His ankle has been the issue and he has been receiving intensive treatment for it. 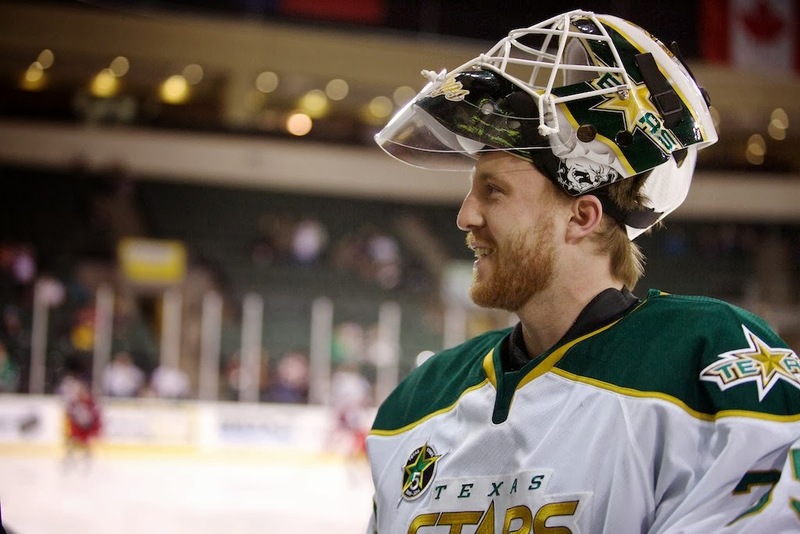 The Texas Stars, proud American Hockey League affiliate of the Dallas Stars, announced today that the club has recalled goaltender Pat Nagle from loan with the Idaho Steelheads, the team's ECHL affiliate. Nagle, 25, was recalled to Texas for the first time on January 23rd and dressed as the backup goalie for the Stars' two home games against the Grand Rapids Griffins last weekend. The Bloomfield, Michigan native returned to Idaho last Sunday and stopped 27-of-29 shots in the Steelheads' 3-1 loss to the Bakersfield Condors. Nagle has appeared in 23 games for Idaho this season, posting an 11-11-1 record, with a 2.79 goals-against average, a 0.920 save percentage and one shutout. 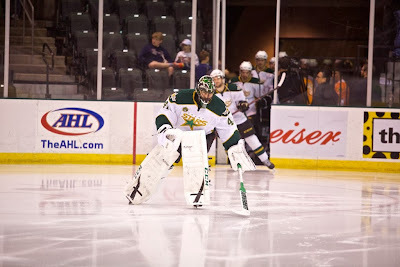 He signed a standard AHL contract with the Stars on August 27, 2013. If you watched read the postgame for Saturday's 4-1 loss, you know that Chris Mueller felt that the power play cost Texas the game. They were 0-for-5 on the night. "They obviously scouted us with those seam passes and took those away so maybe we have to go to an overload certain games and react to how they kill." OK, let's break that down. It's sort of a statement that jumps to the next level of understanding hockey for many casual fans. With the Texas power play being as good as it is, it's probably a good idea to better understand some of the terms that come with the territory. First of all, the power play has two different personnel choices. Traditionally, power plays go with three forwards and two defensemen, exactly what you see in normal even-strength situations. A number of power plays more recently have started using four forwards and a single defenseman. For Texas right now, the lines are a little juggled thanks to the injuries they are suffering. Overall, the Stars employ one four forward set while the second unit has alternated between traditional and four forwards. The first unit is comprised of Colton Sceviour, Travis Morin, Curtis McKenzie, Chris Mueller and Maxime Fortunus. The second unit is generally some combination of players from Dowling's line and Jyrki Jokipakka. That unit will add a forward or defenseman, depending on personnel availability. Those have included Scott Glennie, Matej Stransky, Brendan Ranford, Derek Meech and Jamie Oleksiak. Mueller said that Texas might need to switch to an overload style in order to beat the scouting of the Griffins. Overload is one of the ways to setup your players once you've established yourself in the zone. Overload places three of your five skaters on one side of the ice, which matches them against only two penalty killers. One of the skaters is below the goal line, one at the hashes and the defenseman plays the blue line. On the other side of the ice, one defender is at the blue line while the remaining skaters is at the faceoff dot. This might sounds familiar from other seasons with the Texas Stars. Matt Fraser and Greg Rallo were common fixtures on that weak side. Texas has moved toward an overload out of necessity on some recent power plays, not having enough forwards to fit four on the second unit. Umbrella is a fairly common way to align your players, especially in a four forward setup. The defenseman sets up in the center of the blue line. From there, he can shoot straight in or pass off to one of the two forwards at the top of the faceoff circles. The other two skaters line up near the crease and are able to shoot, rebound, tip and screen. If you head to the AHL highlights page and watch the replay of the Stars' first goal from last week's game against the Iowa Wild (starts at :26), you will see this setup happen. Max Fortunus is the high man on the blue line. Morin and Sceviour setup at the top of the circles, and Mueller and McKenzie are down low. You can see even from that highlight how easy it is to create havoc at the net with two players in that crease area. Mueller commented that the Stars rely a lot on seam passes, which the Griffins took away. The 'seam' is the center lane of the ice. Here's a good example of a successful seam pass from the NHL playoffs last season. Other common setups include the spread, slot set and 1-3-1. The spread puts two forwards near the goal line, aligned left to right with the defensemen at the blue line. The fifth forward is right in the center at the high slot. Overhead, the setup looks a lot like the five face of a dice. The slot set is like the overload, but the weak side forward is in front of the net instead of at the weak side faecoff dot. The 1-3-1 puts the defenseman in the center of the blue line, similar to the umbrella. Two forwards line up on the faceoff dots, while the other two are down the middle in the low and high slot, respectively. As it just so happens, the Idaho Steelheads haven't played a single game since the Stars recalled Pat Nagle. That's a good thing for the Steelies as they also have a single goaltender remaining on the roster without him. Texas announced today that they have sent Pat Nagle back to Boise, at least for today's game. According to sources, it is expected that Nagle will start for Idaho against the Condors today at 6:10 PM CST. It is unclear at this point if Nagle will return to backup Josh Robinson on Wednesday or remain in Boise. Cristopher Nilstorp was not in a boot or on crutches after Saturday's game. It is believed he could return for the weekend set against Toronto and OKC. While it was not an automatic review, the Stars did get a review of the hit that knocked Justin Dowling out of the lineup for last night's game. Brennan Evans, who received a five minute major and a game misconduct for the hit, also received a three game suspension starting with today'sg ame in San Antonio. Triston Grant also received a one game suspension for a slew foot on Texas on Friday. He will also sit out today's game at San Antonio. Unfortunately, the Stars saw both of those players in the lineup against them last night in Cedar Park. 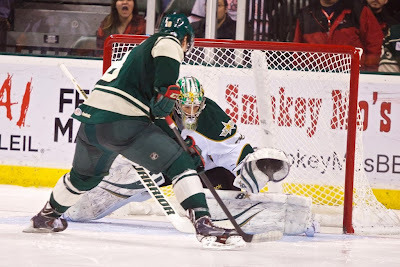 A solid first period and a forgettable second put the Texas Stars back in second place in the conference this evening as they dropped a 4-1 decision to the Grand Rapids Griffins. The Griffins are tied with Texas in points after tonight but have the advantage of fewer games played and therefore better points percentage. Texas split the weekend with Grand Rapids. "We know they're a good team," said Coach Desjardins. "If it's a series in our rink and we come out 1-1, that's not great because now we're in their rink. If we started in our rink, we've lost home ice advantage and if we started in theirs, we're down 3-1 and going into elimination." Chris Mueller, who had the game's only goal for Texas, added, "We see this as a failure, splitting at home." Texas had been red-hot at home coming into the game, streaking to twelve straight wins at the Cedar Park Center. "Coming into the season," said Maxime Fortunus. "We wanted to be better at home, and that's one of the biggest things we wanted to do to get into the playoffs." The Griffins were happy to come in the second night and pick up the win against a tough home club with a sellout crowd. "They're as deep a team as we've faced all year and they're extraordinarily well coached," said Griffins' head coach Jeff Blashill. "We feel real good to come in here and get the win tonight." "They are very deep and also play so hard and come at you with a good aggressiveness and put you on your heels. Their record at home is good because they're just on you." Josh Robinson got the start and stopped 28 of 32 shots against. The Stars and Griffins skated to a scoreless first period despite a pacey start. Overall, the two clubs were better matched than last night's first period. The period ended with shots in the Stars' favor 13-11. Scoring action picked up in the second with a total of five goals between the two clubs. The Stars went first off a nifty play from Scott Glennie. Glennie broke into the zone down the right wing side and pulled up to make a backhand pass to the trailer, Chris Mueller, who beat Tom McCollum high glove. Unfortunately for the sellout crowd, it was Grand Rapids the rest of the way. Mitch Callahan put up his 17th of the year on an in and out play. The puck hit the back center bar of the Texas net and came right out. Josh Robinson heard the 'ting' of the iron and protested the goal, but it stood. The Stars got in penalty trouble in the middle of the period and gave up two more. First, the Griffins won a clean faceoff forward and into the net of Robinson on a short 4-on-4. Had that goal been scored three seconds later, the power play would have been wiped off the board. "[Goals off the faceoff] happens maybe once a season. I can't remember the last time I saw that," said Fortunus. The power play ensued, and just a few seconds later, Landon Ferraro scored on the power play as Teemu Pulkinnen found him all alone in the right wing circle. Ferraro lit the lamp for a second time on the night on a 2-on-1 break. Jordin Tootoo and Ferraro broke away with Oleksiak back and Meech trailing the play. The vet D-man couldn't make it back to Ferraro before he rifled the pass behind Robinson for the 4-1 lead. Robinson allowed four goals on eleven shots in the period. "Goals create momentum a lot," said Blashill. "Last night we played fine and the goals hurt us momentum wise. [That goal] was a huge turn of events." Texas couldn't get anything going in the third period to help their case. The Stars continually had issues on the breakout passes from their own zone. It was as much the Griffins clogging the lanes as it was Texas just not making clean passes. To make matters worse, the league-leading power play was held scoreless on five chances. "Our power play lost us the game today," said Mueller, who plays on the first PP unit. "Sometimes you aren't going to get the bounces, but we didn't create any momentum on them. The power play let the team down a little bit." The Stars even had to kill a full two-minute 5-on-3 penalty late as Travis Morin and Mike Hedden went to the box for high sticking and unsportsmanlike conduct, respectively. As the hoem stand continues, Texas looks to use the weekend series as a measuring stick to where they need to be and also as a way to solidfy the message around their system. "For us, we knew that if played our game for sixty, there's not a lot of teams that can play with us," said Fortunus. "It's about making sure we have twenty guys on the ice ready to go." Texas will face the San Antonio Rampage on Wednesday at home. Mike Hedden scores the game winner and the crowd goes wild. For at least a few hours, the Texas Stars are the first place team in the Western Conference thanks to a 6-4 win tonight over the Grand Rapids Griffins. "We were excited to go tonight with first place on the line," said Mike Hedden, who scored the game winner and had two assists in the contest. After Texas burst out to a four goal lead by the start of the second period, the Griffins switched goalies and started to chip away at the Stars' lead. "When their other goalie came in, he made some good saves and they got some greasy goals," said Colton Sceviour, who had a single goal tonight. "That's the type of game they play. They're a simple hardworking team. That's how they've been successful recently." The Stars never trailed in the game but had some tense moments as the two clubs combined for 39 shots in the third period alone. Texas set a franchise record with their total shot count of 59. The Griffins put up 42 for a total of 101. "They're a good team that doesn't give up a lot of goals, so you have to get pucks and bodies to the net all night. Any chance we had, we were trying to get pucks to the net." Coach Desjardins looked at the Griffins' ability to claw back into the game as a good measuring stick for his team. "You don't win championships by not having a lot of character," he said. "That's a playoff type team the way they play and it's good for us to face that." The win extended Texas' home winning streak to twelve. Josh Robinson got the start and stopped 38 of 42. Pat Nagle backed up, having made it from Boise earlier today. The Stars got things started early with some defensive point shots that found twine. Former Griffin Derek Meech went first on a shot straight up the guts off the pass from Justin Dowling on the 4-on-3 power play. Brendan Ranford went next, tipping home a point shot from Cameron Gaunce. Hedden added, "We wanted to get a lot of shots on net and traffic on net. A lot of our goals were guys hard to the net getting screens." Ranford scored again off a frenetic play in front that saw Dowling and Hedden break into the zone two-on-one and Ranford come in as the cleanup man to score. Texas ended the period up 3-0 and outshooting the Griffs 23-11. Travis Morin tacked another onto his goal total with his 25th of the season, getting a stick on a shot from William Wrenn sneaking down the right wing side. That would end the night for Grand Rapids' tender Tom McCollum. Jared Coreau came in as the reliever and mopped up pretty well. Grand Rapids picked themselves up and tallied two before the end of the period. Trevor Parkes finished off Triston Grant's wrap-around and Teemu Pulkkinen wristed one past Robinson three minutes apart to cut the lead to 4-2. The third period opened with a rough hit on Stars' center Justin Dowling. Brennan Evans hit Dowling up high, squarely in the nose, in neutral ice. William Wrenn stepped up for the fight as Dowling left the ice under his own power. He would return later in the game. Wrenn picked up the unsportsmanlike for starting the fight, but Evans got five for fighting, five for elbowing and game misconduct. Surely a league review will follow. Texas scored a power play goal on the ensuing major. Hedden describes the tally, "I had a step on the D and knew Oleksiak was going to put the puck on net. I just went there hard and got good position on the guy and the good tip." The fifth goal ended up being the game winner. The Stars would tck on the insurance goal at 10:29 of the third. Sceviour's 27th of the season was a wrap-around tally, assisted by Hedden and Morin. Penalty trouble gave Grand Rapids life as the period was dwindling. "They're a team that you can't let up on. They have a lot of scoring ability there. We did a poor job staying out of the box and gave them the ability to crawl back into the game." Teemu Pulkkinen scored on a 5-on-4 PP from the point to make it 6-3 then Morin and Chris Mueller found their seat in the box on slashing and roughing calls, respectively. Jeff Blashill pulled Coreau and setup a 6-on-3 power play. "I can't say I've ever killed 6-on-3," said Sceviour. "I don't kill 5-on-3 that often either. You have to go out there and hope the puck hits you on those point shots. Their d-men had both their late power play goals, getting pucks through with traffic in front." Adam Almquist scored 6-on-3, but that was it for the Griffins. The final of 6-4 sets up another battle for first place tomorrow, this time with Texas defending the top spot. 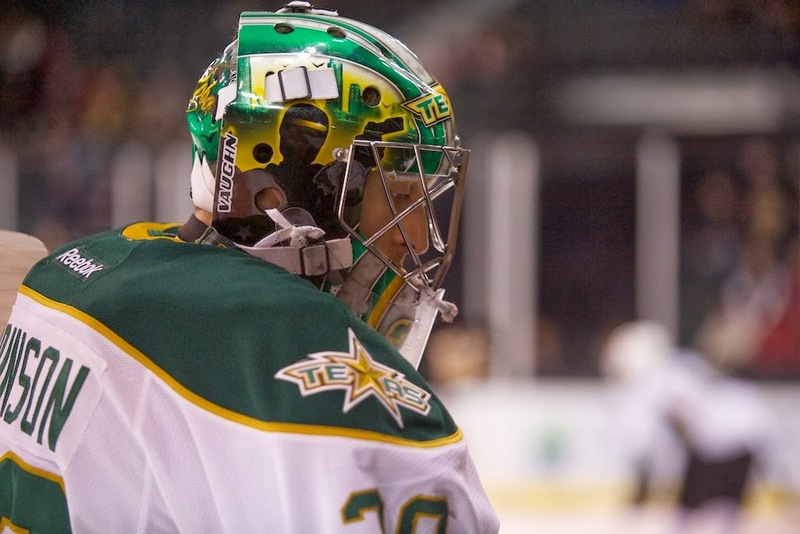 Well, here's your answer on the Texas Stars goaltender situation. Texas will callup Pat Nagle to backup Josh Robinson this weekend against Grand Rapids. After the injury to Nilstorp, the Stars are without both of their 'main' goalies. Jack Campbell is still 'a ways' out, according to Coach Desjardins. So here we are. Texas will play the defending Calder Cup champions and current conference leaders with the team in net that was anticipated to play all year in Idaho. If you feel like that's rough, just imagine how fans in Boise feel right now. 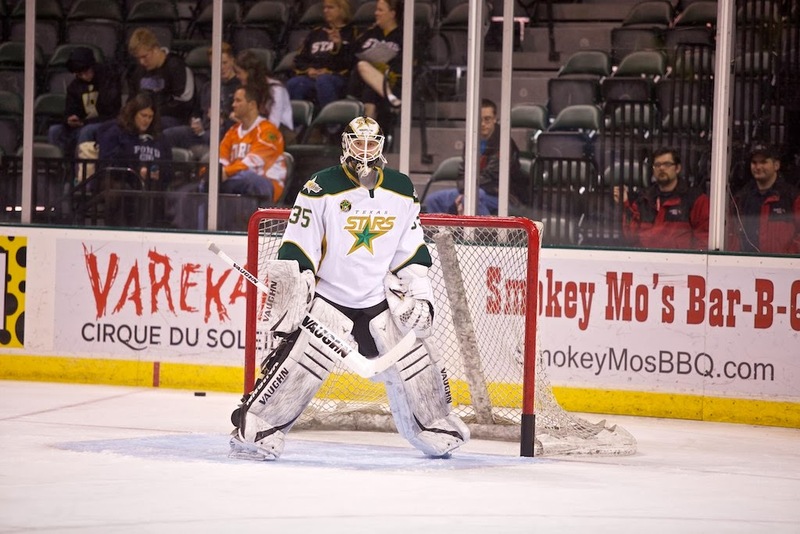 The Texas Stars, proud American Hockey League affiliate of the Dallas Stars, announced today that goaltender Pat Nagle has been recalled from loan with the Idaho Steelheads, the team's ECHL affiliate. 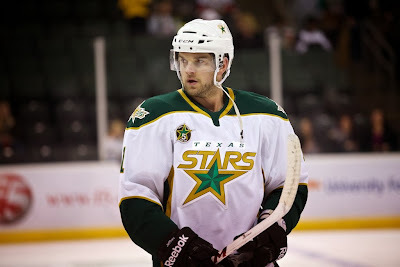 Nagle, 25, signed a standard AHL contract with the Stars on August 27, 2013. 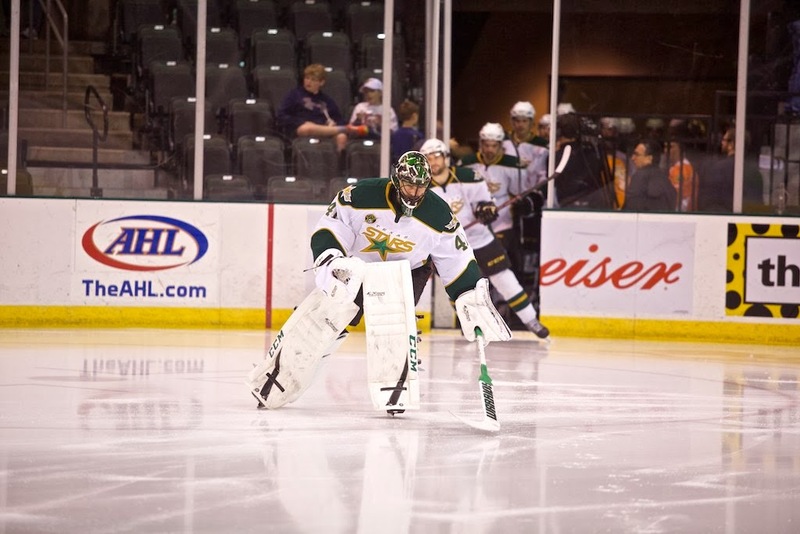 The Bloomfield, Michigan native attended the Stars' training camp this fall, appearing in one pre-season game made 21 saves to combine with starter Josh Robinson for a 3-0 shutout win over the San Antonio Rampage on September 29th at Cedar Park Center. Nagle was loaned to Idaho on October 1st and he has appeared in 22 games for the Steelheads this season, posting an 11-10-1 record, with a 2.83 goals-against average, a 0.920 save percentage and one shutout. Last season he made his AHL debut with the Syracuse Crunch on March 6, 2013 at Toronto, entering the game at 2:24 of the second period to relieve starter Riku Helenius in a 6-3 loss to the Marlies. Nagle made his first career AHL start on March 21, 2013 at home against Binghamton Senators and remained with the Crunch and dressed as the backup goaltender for every game of the team's run to the 2013 Calder Cup Finals. During his rookie season he helped the ECHL's Florida Everblades win the 2012 Kelly Cup Championship, beating the Las Vegas Wranglers in the Finals in five games. Nagle was undrafted after playing four years of NCAA Division I college hockey for Ferris State University of the CCHA. They needed a shootout to do it, but the Texas Stars extended their home winning streak to eleven games with a 4-3 victory over the Iowa Wild tonight in Cedar Park. The Stars battled back from two one-goal deficits to find themselves tied with time winding down. Texas looked to have the game won with a goal by Colton Sceviour with 64 seconds left in the game. The Wild answered back with the extra attacker to take the game to a shootout. "They got one early and we battled but couldn't score. They're good defensively and don't give you a lot of looks in front of the net. The power play was big tonight." Chris Mueller, who had a goal an assist and the shootout winner, added, "We have four guys that like to score [on the first power play]. Teams like to scout and take away one or two options, and that folds power plays. We have four or five options." In injury news, Texas lost Cristopher Nilstorp in the game to a left leg injury. He was relieved by Josh Robinson, who got the win with 10 saves on 12 shots in relief. "It's hard to do, sit and then be called upon to make big saves and get into the shootout," said Mueller. "He's been doing a great job in practice and we're happy for him." Coach Desjardins does not expect Jack Campbell to be ready for the weekend, potentially leaving Josh Robinson as the top man in net for the Stars as they face the number one team in the conference for back-to-back games. The scoring got started on the flukiest of power play tallies for the Wild. Matej Stransky took his seat in the box and Iowa needed just one faceoff and a total of seven second to draw first blood. Brian Connelly's shot off the faceoff win rainbowed up over Derek Meech and a kneeling Cristopher Nilstorp and gently into the back of the net. Jon Landry and Raphael Bussieres assisted on the tally. "Even their guy was laughing when it went in," said Mueller. "There's not much you can do. Nilstorp was screened and their guy didn't expect to score there. Goals like that, they're not going to beat you. That's what we said on the bench. We're working too hard for a goal like that to beat us." Texas seemed to be having trouble getting things going as the first and second progressed. Despite a plethora of shots, the quality was rather low overall. Johan Gustafsson stopped 26 shots in the first and second combined. The Stars did not get on the power play until late in the second period. After a few iffy no-calls, the Wild were nabbed for two minors, Tyler Cuma for holding and unsportsmanlike. In the end, Texas would score on the advantage but not before going down by a man in a different way. After stopping the puck behind the net, Cristopher Nilstorp navigated his way back to the crease, backing around the left wing side of the net. A forechecking Chad Rau caught the back of Nilstorp's left leg. Nilstorp went down in a heap and had to be helped off the ice, unable to put weight on that leg. Josh Robinson came in. There was no penalty on the play, which appeared to be incidental contact. "You're supposed to avoid the goalie at all times, right?" said Mueller. "Hopefully we wasn't trying to take his leg out and knowing Rau, I don't think he would. It is what it is. The refs thought it wasn't a penalty and you have to respect their decision." Coach Desjardins added, "I like the ref. He made the call and was decisive. I might not agree with it, but I have the advantage of watching it on video. It's a lot tougher when it's happening quick. He made the call." As the third period opened, Texas got the power play goal they needed to spark the offense. It wasn't pretty, as the net came off its moorings as the puck went in off the stick of Curtis McKenzie. However, the goal, assisted by Chris Mueller and Travis Morin, set the score at one all. Iowa bit back with Raphael Bussieres breaking in alone off a pass that went through the legs of the Texas defender. The puck slid five-hole for the 2-1 Wild lead. Less than three minutes later, the Texas power play activated again. This time Travis Morin completed a pretty pass from the right wing circle to Chris Mueller on the back door for the tap-in goal. Colton Sceviour had the second assist. "That's just a great job by Sceviour to hit Morin in the seam. I should have had two from Morin but McKenzie got my first goal," said Mueller, smiling. "That's just two great plays by Morin." Sceviour got one of his own late that seemingly sealed the deal. Breaking in with Morin, Sceviour received the pass from his center iceman in the right wing circle and sniped one high glove on Gustafsson for the 3-2 lead with 64 seconds left. That lead didn't last long as the Stars got discombobulated in their own zone, leaving Zack Phillips uncovered as the puck zoomed through Robinson's crease and out to the slot. Phillips was the only one with eyes on the puck, which he buried for the three all tie and a chance at overtime. "It somehow eluded three of us, and they found it," said Robinson. After no scoring in the overtime period, Texas headed to the shootout. "We outchanced them in overtime. We've been winning games by a lot early so we haven't had to play a third period. This is how games are going to be down the stretch." On the season, the Stars had an 0-3 record in shootout games. They got their first win thanks to some solid work from Sceviour and Mueller. Sceviour used his typical forehand-backhand move to beat Gustafsson after Carson McMillan scored on the opening round shot. Mueller picked up his goal in the third round while Josh Robinson stopped four of five to seal the win. "Nilstorp told me to go high glove any chance I got," said Mueller. "[Gustafsson] dipped the glove at the end, and I just put it over top." Texas is next in action on Friday at home against the conference's top team, the Grand Rapids Griffins. Mueller on Glennie: "I love playing with Glennie. We didn't practice for three days and that put him in a bad spot for conditioning. I thought he did great and provided a lot of jump and speed." Coach on Glennie: "Glennie was real good tonight. He battled hard and skated. He's a big plus when we get him back." 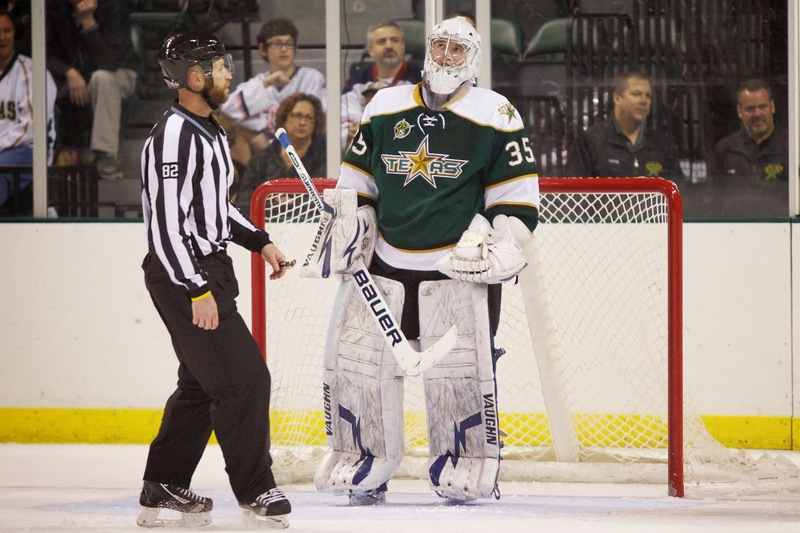 The Texas Stars have sent Russ Sinkewich back to the ECHL's Toledo Walleye. Sinkewich joined Texas on a PTO in mid-December and was converted over to a standard AHL contract on January 15th. The Stars have Fortunus, Meech, Wrenn, Labrie, Gaunce, Jokipakka and Oleksiak all healthy in their lineup now. Jokipakka was out on Saturday, putting Sinkewich in the lineup. Patrik Nemeth is still out recovering from foot surgery after a stress fracture. The Texas Stars, proud American Hockey League affiliate of the Dallas Stars, announced today that defenseman Russ Sinkewich has been loaned to the Toledo Walleye of the ECHL. Sinkewich, 28, originally signed a PTO with Texas on December 18th, has three points (1 goal, 2 assist), a +1 rating and two penalty minutes in seven games for Texas this year, including scoring his first career AHL goal on January 3rd at Charlotte. The Westlake, Ohio native also has eight assists and 25 PIMs in 20 ECHL games for the Toledo Walleye and has one assist in one AHL game for the Lake Erie Monsters. Sinkewich originally signed a professional tryout contract (PTO) with Texas on December 18th and was signed to a standard AHL contract by the Stars on January 15th. Undrafted after playing four years at Bowling Green State University, Sinkewich is currently in his fifth pro season and has played in 275 career pro games, including 70 in the AHL for Texas, Lake Erie, Milwaukee, Abbotsford, Bridgeport and Portland, recording seven assists and 47 penalty minutes. The six-foot-three, 215-pound blue liner made his Calder Cup playoff debut last season with the Portland Pirates in their first round series against the Syracuse Crunch. Sinkewich won the 2011 Kelly Cup Championship as a member of the Alaska Aces. There are a lot of confusing concepts in the hockey world in general and the American Hockey League specifically. Every year I get a lot of questions about how some basic things work, like waivers, two-way contracts, and the veteran rule. It's important for every fan to have a working knowledge of a lot of these ideas and be able to reference a more in-depth source when needed. To that end, I'm releasing the 100 Degree Hockey AHL Glossary today. You can find the Glossary on the navbar above between "About" and "Attendance" or by clicking here. Thank you to everyone who suggested topics over the past few weeks. Please continue to ask those questions and we'll add more to the page as we go. After last night's 7-1 Texas win, it was a morning to forget for the Stars as they dropped a matinee to the Checkers by a 5-1 score. Similar to last night for Charlotte, the Texas Stars were down 3-0 before the end of the first period. Texas got one back off the stick of Curtis McKenzie, but it was far from enough to spark the comeback. Overall, it seemed like both teams were still playing like it was the third period of last night's game as today's game started: barely any shots from Texas and lots of action from the Checkers. That meant that Texas got outshot heavily and was taken by surprise by the Checkers. Charlotte scored twice more in the second period and added one in the last minute of the third to set the final at 6-1. Cristopher Nilstorp got the start and dropped his first regulation loss since December 20th, a span of nine games. He stopped nine of 12 before giving way to Robinson. Justin Shugg got things started on a goal that seemed like an eventuality. Trailing on shots 5-1, the Checkers sixth goal pierced the Stars armor through traffic for the 1-0 lead. Cristopher Nilstorp, who got the start, didn't see the puck through the screen and had it go over his blocker and in. Aaron Palushaj added to his goal tally with his second and third goals of the weekend against Texas within a three minute span. Those two tallies would end Nilstorp's afternoon, bringing in Josh Robinson. Texas got one back with Curtis McKenzie just putting one on net from outside the Checkers' zone. It was a puck that John Muse should have had but didn't. Cameron Gaunce got the only assist. Robinson did not fair much better than the start Nilstorp. Zach Boychuk scored on a shot under Robinson's glove in the second period to conitune the scoring spree. Philippe Cornet, the former San Antonio Rampage, picked up his sixth of the year as Texas had a defensive breakdown and left him uncovered for the pass from Matthew Pistilli. Victor Rask padded the lead in the final minute of the game off a nice pass from Dan Biega. Josh Robinson shattered his goal stick in frustration. It was that sort of game for the Texas Stars. Texas is back in action Wednesday at home against Iowa. It's not the earliest game the Stars will play this year, but it's an odd one considering that the Stars played last night at 6:00 PM CST. From the end of the game to puck drop today will be no more than sixteen hours. The Checkers are doing a doubleheader with the Charlotte Bobcats of the NBA. Both teams use the Time Warner Cable Arena but there will be a four hour delay as they change over the facility for basketball. Texas hinted at its plan for goaltending with the move to put Robinson in last night for the third in a 7-1 game. Nilstorp will likely start. Other lineup changes may include the loss of Jykri Jokipakka, who missed the third period of last night's game. Texas has several extra defensemen on the trip, including Sinkewich and Button, who both played at forward last night. One of those two or William Wreen, who was scratched last night, will slide down to defense if Jokipakka can't go. 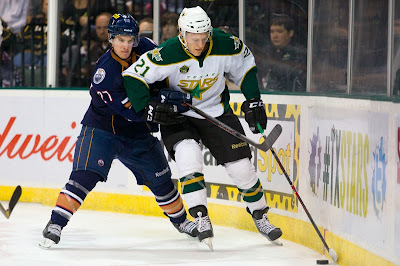 The Texas Stars announced two separate transactions today. First, the team will be returning Brock Montgomery to the Idaho Steelheads. Montgomery only made it into two games while in Cedar Park this go round. The second part of news is that Texas has signed Russ Sinkewich to an AHL standard player contract. He has only gotten into six games since being signed December 18th to a PTO. He collected his first career AHL goal with Texas on January 3rd but hasn't played since then. If he were to be assigned to the ECHL, he would likely go back to Toledo unless his rights were traded inside the ECHL. Texas's blue line now features ten skaters: Button, Meech, Oleksiak, Gaunce, Fortunus, Jokipakka, Wrenn, Labrie, Sinkewich and Nemeth. Nemeth is still injured and out for a time. Ryan Button has also been playing as a forward for a few games. To me, this could presage one of two things. Either Dallas is anticipating a move and would like to ensure that the Texas Stars will have enough defensemen in the case of the likely recall of Cameron Gaunce in that case. The other case would be that Texas is expecting to somehow move Sinkewich's rights in the ECHL to Idaho and assign him there. After losing Etienne Boutet to the college route, the Stars are a little thin at the defensive position in the ECHL. Both of their ECHL defensemen, Labrie and Button, are playing in Texas at the moment. 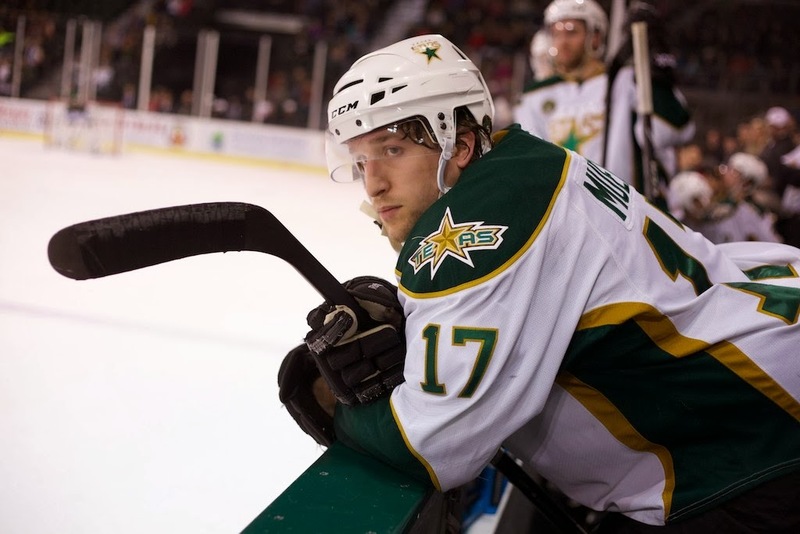 The Texas Stars, proud American Hockey league affiliate of the Dallas Stars, announced today that the club has returned left wing Brock Montgomery on loan with the Idaho Steelheads, their ECHL affiliate. Texas also announced that defenseman Russ Sinkewich was released from his professional tryout contract on Wednesday, January 15th, and signed to a standard AHL contract. 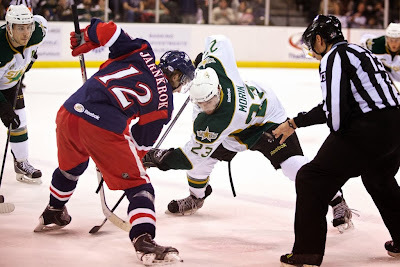 Montgomery, 21, made his professional debut with Texas on October 5th against the Chicago Wolves and has played in five AHL games with the Stars this season, notching no points and nine penalty minutes. 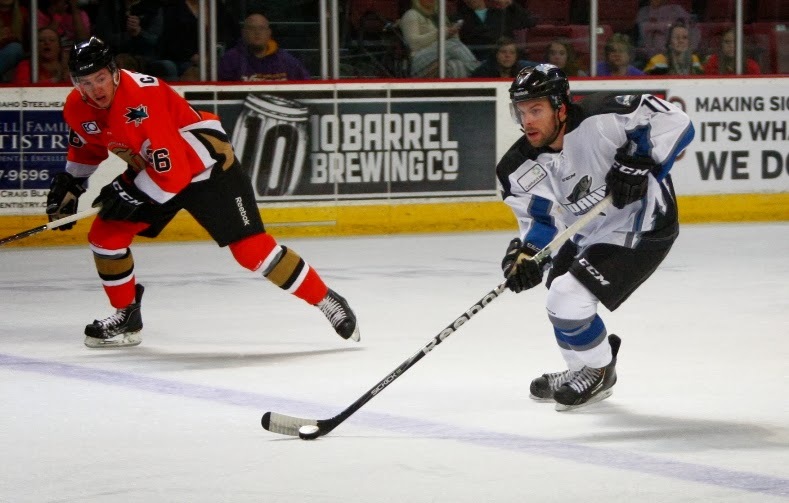 The Moose Jaw, Saskatchewan native was originally loaned to Idaho on October 25th and has appeared in 21 ECHL games for the Steelheads, recording 15 points (5 goals, 10 assists), 11 penalty minutes and a +6 rating. Montgomery signed an AHL contract with Texas on March 30, 2013 after completing his fourth season of major junior hockey with the Kootenay Ice of the Western Hockey League. In 243 career WHL games he had 119 points (65 goals, 54 assists) and 328 penalty minutes. Sinkewich, 28, originally signed a PTO with Texas on December 18th, has two points (1 goal, 1 assist) and two penalty minutes in six games for Texas this year, including scoring his first career AHL goal on January 3rd at Charlotte. The Westlake, Ohio native also has eight assists and 25 PIMs in 20 ECHL games for the Toledo Walleye and has one assist in one AHL game for the Lake Erie Monsters. As the injury list mounts, Texas heads back to Charlotte to end the season series in North Carolina before the Checkers play a single game at the CPC. Both clubs are on winning streaks at the moment. Charlotte's started with their win two weeks ago over the Stars. Two victories over the OKC Barons stretched the streak to three. The Stars are also on a three game streak, last losing to the Checkers 4-3. That game was the only time in the last ten games that Texas has failed to get a point. In fact, the Stars have collected both points in 8 of those ten, losing in the shootout to San Antonio on December 27th. Two solid games in Charlotte for Texas would really help to springboard them into their longest homestand of the season coming up next week. Seven games, including three total against the divison leading Griffins and Marlies, will challenge the home winning streak that Texas has built over the last two months. The last time the Stars' lost at home was November 22nd. The last time they failed to collect a point was November 13th. Last time these two teams met, Texas was down in both games at the end of the second period. In one, they were able to mount the comeback. In the second, they lost 4-3. "Now we know what they're about and what kind of team they are," Justin Dowling said after Wednesday's game. "We know it'll be tough and a battle, especially the quick turnaround. We just have to be ready to work." As to Charlotte, Dowling also pointed out that Zach Boychuk is back with the Checkers as of this week. He's 14-13-27 in just 29 GP this season for the Checkers. Last season against Texas, Boychuk had three goals and three assists in his six games against the Stars. The Texas Stars extended their franchise-record home winning streak to ten games with a 4-1 win over the Rochester Americans tonight in Cedar Park, as they peppered Amerks goalie Nathan Lieuwen with a season-high 49 shots. 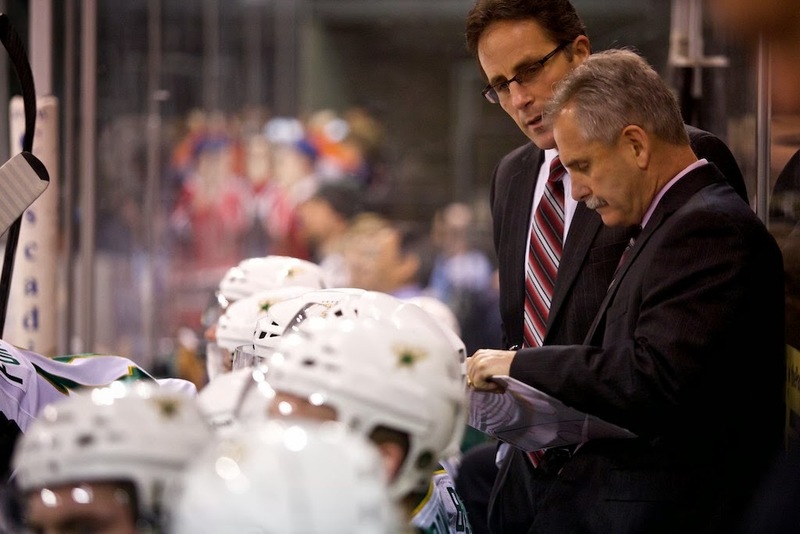 "We had a good start to the game, putting up a lot of shots," said Coach Desjardins. Texas volleyed twenty and twenty-one shots on net in the first two periods, respectively. Lieuwen stopped 45 shots in the game total, including some athletic saves to keep Rochester in it. The Amerks only trailed 1-0 after a first period where they were outshot 20-4. "I remember playing him in junior, and he was a really good goalie then too," said Justin Dowling, who had a goal on the night. "I'm not surprised he played that well. He kept them in it." Taylor Peters, who scored his fourth of the year in the game, philosophized on the genesis of the Stars' shot total, "When you have speed you have time and when you have time, you get shots off." Dowling's goal was the game winner in the franchise-record tenth's home win for Texas. Dowling intoned, "We just have to keep pushing and not stop at ten." The win came without a point for either Colton Sceviour or Travis Morin. That hasn't happened since November 30th's loss to Grand Rapids. Two goals from the newly created line of Stransky, Peters and Mueller made that an inconsequential point. Cristopher Nilstorp stopped 26 of 27. 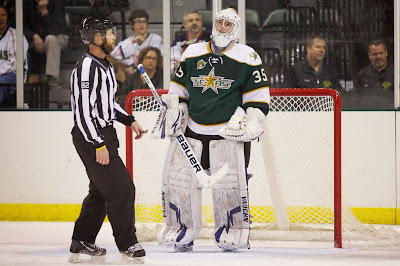 Despite the shot-heavy first period for the Texas Stars, the club only found the net once in the twenty minute frame. After failing to score on a 59 second long 5-on-3, the Stars put one in on Nathan Lieuwen on the 5-on-4 portion that immediately followed. Jyrki Jokipakka was the tail-gunner for the power play tally, which was assisted by Derek Meech and Mike Hedden. Traffic assisted the puck in finding twine, as Lieuwen was screened on the play. The assist by Meech was his first point as a Star. Otherwise, Lieuwen was stellar in the period. He put the clamps on the high-scoring Stars with a few solid athletic plays. For example, after getting completely out of his net on the right side, he dove back across the crease to snare an open-net Travis Morin bid with his glove hand. The Stars appeared stunned. All told, Lieuwen stopped 19 of 20 Texas shots in the first, while Nilstorp only faced four. The Amerks backed up Lieuwen's solid play in the first seven minutes of the second, scoring the tying goal. Jokipakka was guilty of an ill-advised pinch on an on-rushing Amerk forward and left William Wrenn with a two-on-one. Alex Hutchings finished the play with a bell-ringer of a goal off the crossbar. Phil Varone assisted. "It was off the faceoff and Jokipakka got caught halfway," said Desjardins. "He thought he could get to the puck, and he didn't get there. He's not a rookie anymore. He's got 40 games and he shouldn't be making those mistakes." Lieuwen had a bit of bad luck just a few minutes later as the puck, instead of finding his stick, passed under it on a play behind the net. On-coming forechecker Justin Dowling snagged it and scored on a backhanded wraparound for the 2-1 lead. "I got fortunate that there wasn't a goalie in the net, so it made it a little easier," said Dowling with a laugh. Taylor Peters extended the lead to 3-1 with his fourth of the year, collecting a meaty rebound off the right pad of Lieuwen and depositing it in the yawning cage behind him. "Matej had a great play behind the net there, came out and passed it to Wrenn," said Peters. "He hit the shot, and I pushed off a bit and was lucky enough to pull the puck out of the scrum." Coach Desjardins heaped praise on the line of Peters, Stransky and Mueller: "I thought Peters' line had a great night. Their shift to start the first, they had a few big hits. I was a bit worried where that line would fit in with some young guys on it. I was worried if I could play them or not, and they did a really great job for us." The Stars somehow exceeded their shot count for the first period with 21 in the second, totaling 41 through two, despite not putting a shot on net after the thirteen minute mark of the period. That low-shooting trend continued into the third period for the Stars but not for the Americans. Rochester picked up their shot total with 12. As the Amerks rang one off the post early in the period, Texas surely didn't want to find itself in a situation similar to Saturday against Utica where they let the Comets back into the game by letting off the gas. Matej Stransky put the game out of reach for the visitors with his fifth of the year, scoring by flipping one over Lieuwen's glove with a one defender on his heels. Stransky's goal was assisted by Dowling and Derek Meech. Ritchie and Wathier are unlikely to travel with the team to Charlotte. Jack Campbell is 'close', according to Desjardins. 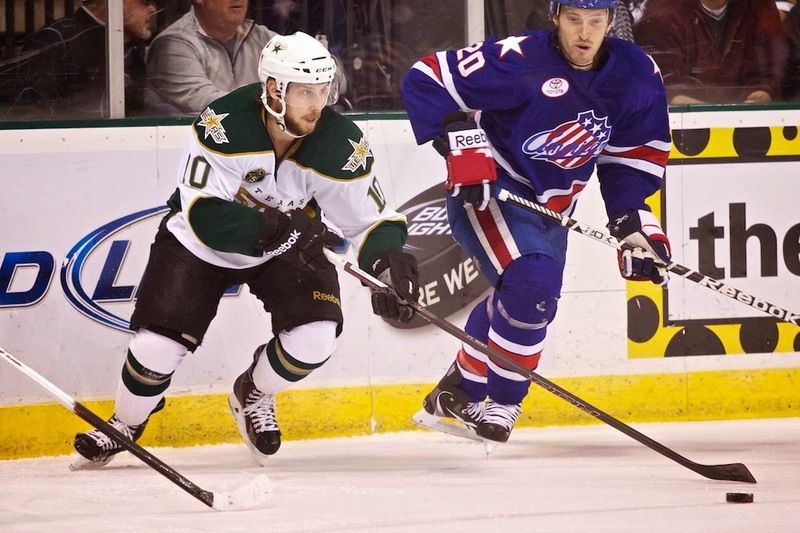 The Texas Stars look to extend their franchise-record home winning streak to ten games with a victory tonight against the Rochester Americans. 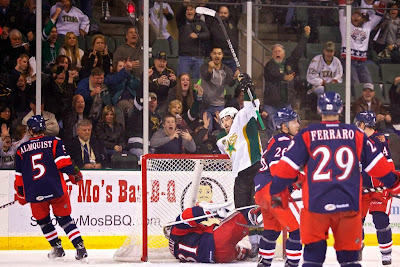 Despite being a Western Conference foe, the Americans rarely visit the Cedar Park Center. In fact, it took until the Stars' third season for Rochester to even visit the CPC once. In those four total games, Texas is 3-1 overall the Amerks. They did not lose the Rochester last season in two games and have not lost to them at home either. Despite the distance, the Americans will likely be led onto the ice by a familiar face, Matt Hackett. The former Houston Aero was traded to the Buffalo Sabres organization last year as part of the return in the Jason Pominville trade. Forward Johan Larsson was also sent to Buffalo in the transaction. Hackett has taken most of the work load between he and rookie Nathan Lieuwen. He's 9-12-2 with a .904SV% and 2.89 GAA. Lieuwen is slightly better at .918 and 2.63 with a 6-5-1 record. Up front, the Americans are led by a trio of centers: Phil Varone, Luke Adam and Mike Zigomanis. Adam, who has spent some time with Buffalo this season, leads the team in goals and is at better than a point per game. High draft picks Joel Armia and Rasmus Ristolainen are players to watch for the Sabres. Both are rookies this season. Unrelated to the Pominville trade, another Houston Aero, Drew Bagnall, joined the Americans this season on a two-year contract to the Sabres. Rochester is in an interesting situation. Similar to the SHL club Farjestad jumping the pond play in the AHL All-Star Game, the Americans ventured to Switzerland to play in the Spengler Cup over the holiday break. The Americans were the last US-based club to participate as well, back in 1996. The tournament features teams from all over the world with a focus on Europe. Canada and Russia both send teams. It usually gives players who would not otherwise have a chance to don their national colors (in the Olympics) a chance to do so. For example, Allen York was one of the Canadian goaltenders this year. The Americans lost all three games they played, including contests against the eventual champion and the runner-up, as well as Team Canada. It's a tradeoff that the team made to make the trip. It's not something that the Stars would probably ever do, but the Americans have a strong tradition of hockey in Rochester and were the first American club to play in the tournament 18 years ago. For more on the Spengler Cup trip, read about it in the Democrat and Chronicle. And if you aren't following Amerks beat writer Kevin Oklobzija (@kevinoDandC) on Twitter, you should probably get on that.